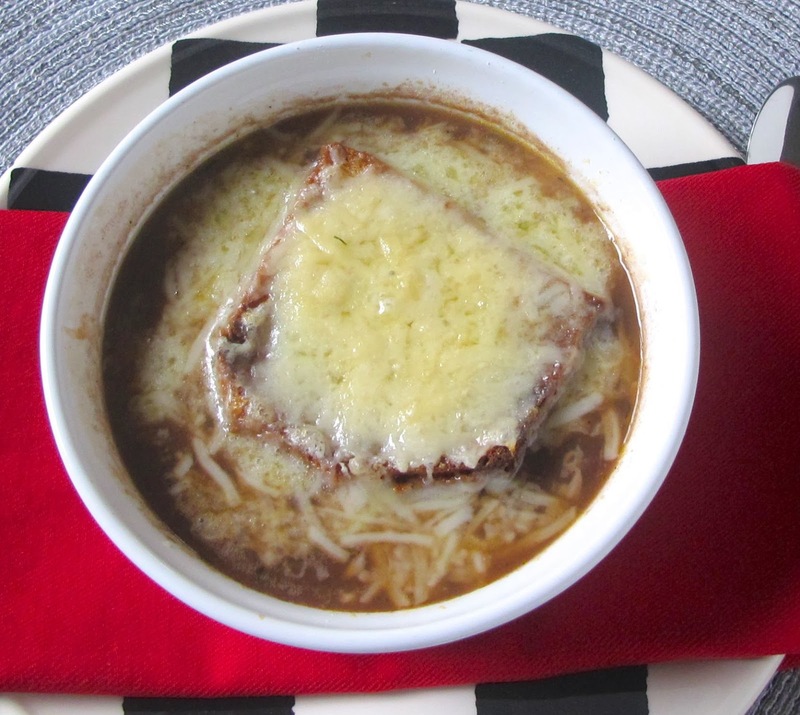 Toasted, cheesy croutons on top of caramelized onions, simmered in wine and stock, that is French Onion Soup. Vegetable stock could be substituted, to make this soup vegetarian. In a large saucepan over medium heat cook onions in the butter and olive oil, add thyme, bay, and salt. Stir frequently and cook until onions are caramelized, about 45 minutes. Add garlic and stir a minute. Add flour and cook, stirring another minute. Stir in wine and cook another two minutes. Add in chicken stock, water, and pepper. Bring to a boil and then reduce to a simmer; stirring occasionally, about 30 minutes. On a sheet pan lined with foil, place toasted French bread topped with cheese, divided, and broil until bubbly and golden. Serve on top of onion soup. Note: If soup bowls are oven proof, put soup in bowls and top with bread and cheese and broil together.